The purpose of being in business is to deliver a product or service that provides value. The value in turn must be measured by metrics that mean something to the customer. Many organisations fail on this, specifically because they measure value in their own terms and not those of the customer. Business Model Design seeks to meet this challenge and bridge the value gap. As a key tool in provision of Business Model Design support, Incremental Group’s consultants use the Business Model Canvas as created by Osterwalder and colleagues. 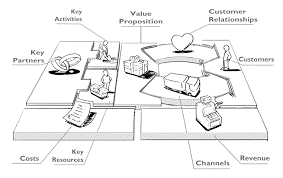 The Business Model Canvas analyses nine factors of the business. Each business offering - service or product – has perceived benefit (value proposition). For each customer type (segment) serviced by the business there may be different ways in which they wish to engage (relationships) and means of engagement (channels). The Business Model Canvas seeks to balance these four factors in the most beneficial way to provide value differentiation recognised across the company and in the market place of operation. Similarly, to deliver each value proposition, key resources will be used and key activities carried out potentially with the support of partners. The Business Model Canvas again seeks to beneficial balance among these factors. Finally analyses of how revenue can be generated from the value proposition and cost of offering the value proposition are conducted. Each workshop will be tailored to your needs and can be carried out at all levels of an organisation. Depending on whether you want to focus on a holistic approach for your business or particular functions to provide a deeper understanding. Whilst each analysis is subject to the complexity of the service or product offering a beneficial level of understanding can be achieved in a five-day consultancy exercise., and a suite of workshops to each target area or function can be pulled together. We also offer an upfront consultancy service to help you identify the best areas to focus on.